Are you planning on shopping for an oval diamond? We don’t blame you. The oval cut diamond is unique, brilliant, and elegant. You can never go wrong with this shape, but before you begin shopping, take a look at these tips so you know how to choose the best diamond possible. One factor you need to consider before picking a stone is the length to width ratio of the cut. 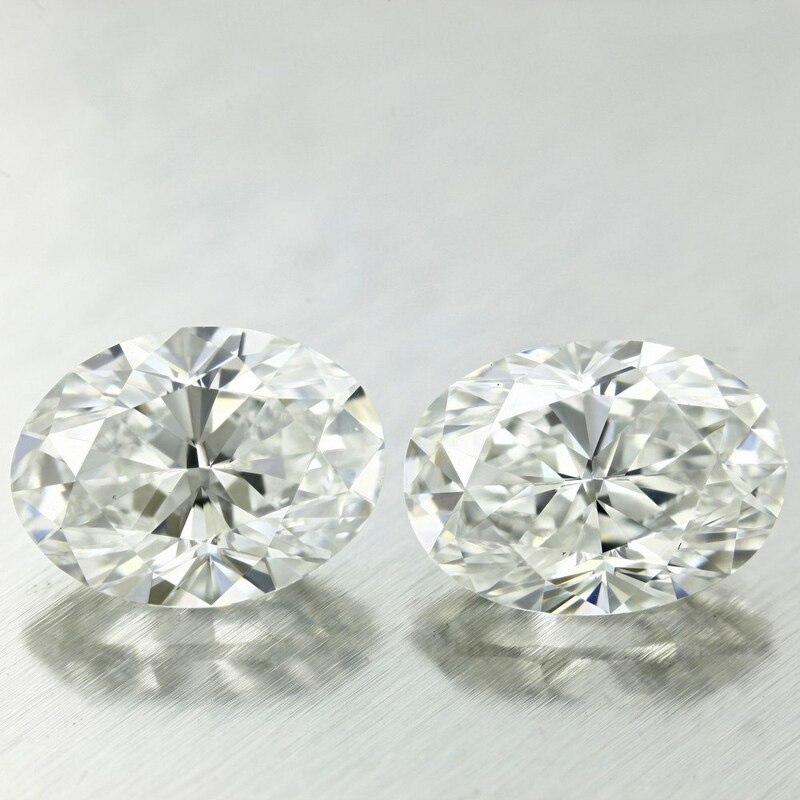 It is recommended you choose an oval diamond with a ratio of 1.35-1.50. If you’re choosing a setting with side stones, try to choose a stone on the higher end of that ratio so it appears a bit thinner. However, if you plan on putting the diamond in a solitaire setting, it’s perfectly fine to stay on the lower end of the ratio so the oval shape is a bit wider. An oval diamond exhibiting an exaggerated bow tie effect in the center of the stone. Another factor of the ratio and cut of the stone is the bow tie effect. The bow tie effect is the appearance of dead space with less brilliance in the middle of elongated fancy shape diamonds. All elongated fancy shapes have a bow tie, but the cut and ratio impact how visible this effect will be. A well-cut oval diamond with the proper ratio showing a minimal bow tie and maximum brilliance. An oval with a ratio inside the suggested 1.35 – 1.50 range will have a minimally visible bowtie, giving you the most brilliant stone possible. Also look for stones that have a symmetry rating of Very Good or Excellent in order to get the smallest and least visible bowtie possible. You will also need to keep the clarity and color in mind when choosing an oval cut diamond. Some oval shaped diamonds show hints of color or small inclusions a bit more than some other shapes, like the round brilliant, so you will need to be careful when it comes to the clarity and color. To avoid seeing color and small inclusions, it’s recommended you find a diamond with at least a H color grade, and a VS1 or higher clarity grade. Although it’s suggested you choose a diamond on the high-end of the clarity and color scale, you don’t have to go overboard with the weight of the diamond. Luckily, oval cut diamonds tend to look bigger than other shapes—even round brilliant stones. 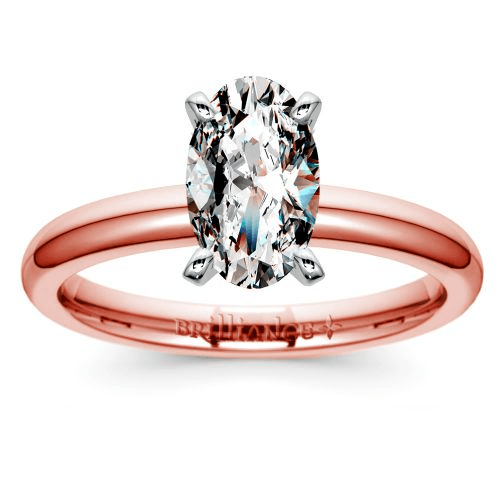 Comfort-fit Solitaire Engagement Ring in Rose Gold shown with a one-carat oval diamond. In fact, a one-carat oval cut diamond has a surface area that is 10% larger than a one-carat round diamond, so it will look much bigger even though they’re the same weight. This means you can go for a slightly smaller carat weight without sacrificing the size, but this might mean being able to get that better color and clarity for a truly stunning stone. Now that you know how to choose the actual stone, it’s time to find the perfect setting to put it in. Prong settings are by far the most popular choice for loose oval diamonds because they don’t cover any of the stone. 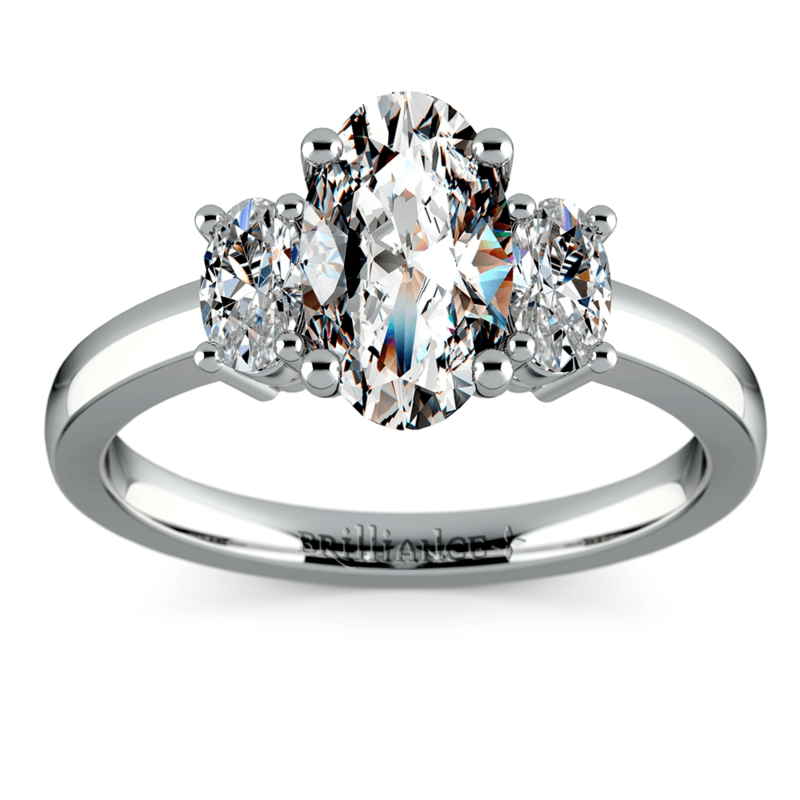 A four prong Oval Diamond Engagement Ring in Platinum. Many people opt for 4-prong settings that leave more of the stone visible, however it may be wiser to look for a 6-prong setting instead. Four prong settings may be enough for square or rectangular shaped stones, but because of the unique shape of the oval, a 6-prong setting may be the safer choice to ensure the diamond is secure. Consult with your jeweler about the best way to secure your diamond in the setting that you choose. 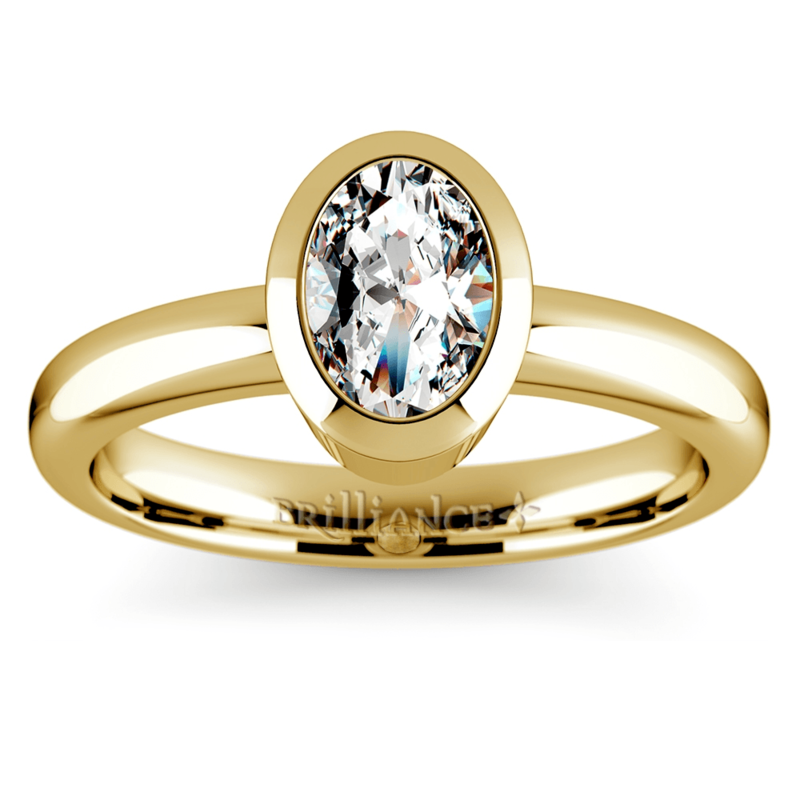 Bezel Solitaire Engagement Ring in Yellow Gold shown with an oval cut center stone. Because they fit well in vintage style designs, many shoppers go the opposite route and choose a bezel setting for their oval diamond, which holds a stone in place by surrounding it with a continuous wall of metal. This setting style is very secure and works well with Art Deco inspired jewelry. The only downside to bezels is that they usually do not allow you to view the full diamond from the side. If your diamond has small inclusions, this is a great way to cover them from view. Once you have found the perfect diamond and chosen a setting, the rest is up to you. 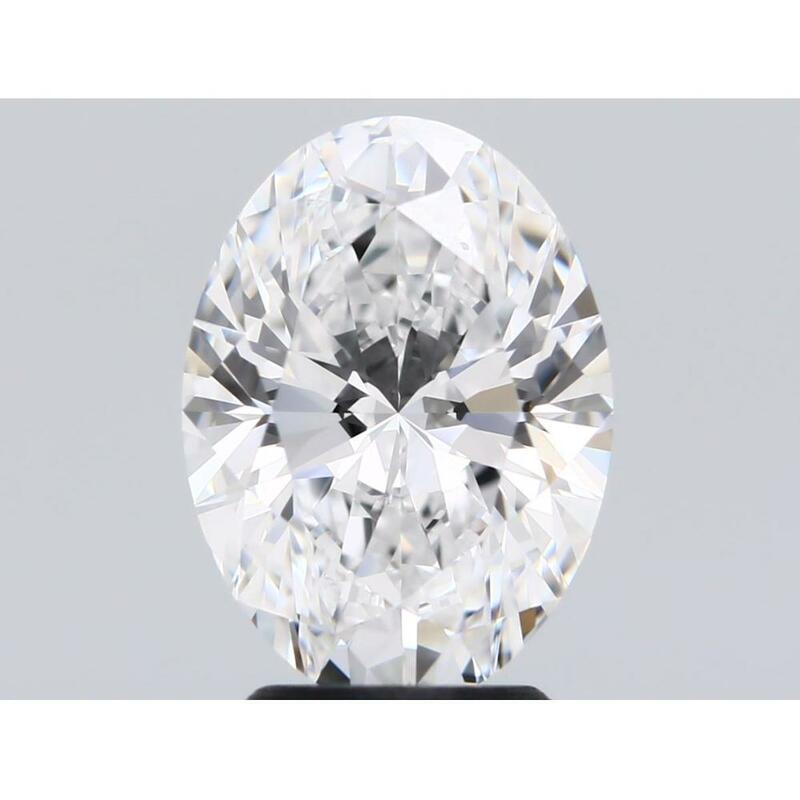 The oval diamond is just as versatile as a round brilliant diamond, so feel free to select any metal, style, or complementing stones that you would like. The beauty of the oval is sure to steal the show no matter what.